Check out these ways to stay positive and motivated while all your co-workers are far away. Remote working, while increasingly popular among employees, is hard. Mostly because most leaders don't consider the special needs remote workers have. Although it may feel like a blessing to work from home -- no time on commuting, for starters! -- it’s a lot more difficult to bond with your co-workers, stay engaged in company culture and a feel like a part of the team. Yet, more than 50% of workers who telecommute part time wish to increase their remote hours. To help you with that, here is a list of ways to stay positive and motivated while all your co-workers are far away. 1. Find your most productive work hours. Not everyone is productive at the same times of the day, which is why it’s great to have a job where your hours are a bit more flexible than a classic nine to five. This infographic by Podio explains where the traditional eight-hour workday came from -- and why it doesn’t suit everyone. If you have that flexibility to choose your own work hours, make sure that you’ve gone for the right ones. If you’re fine with the traditional arrangement then that’s great—but just to make sure, take a week or so to observe when your energy and performance levels are the highest. Regardless of whether it’s at 6 a.m. or 11 p.m., schedule your work hours accordingly. That way you can plan your tasks better as well—if you’ve got a massive assignment in your hands, you’re better off doing that within your personal most productive hours. 2. Have an awesome task-management system. Effective task management or status reporting system is vital for every remote team. Not only to make sure all work gets done—and done effectively—but also to give meaning and context to the work one does. Harvard Business Review writes that "of all the things that can boost inner work life, the most important is making progress in meaningful work.” When working remotely, the only way to understand the meaning of what you do for your team can be achieved by constant communication. 3. Find ways to celebrate. Connection with people you work with is the key. Be sure to maximize the effect of communication technology and share personal successes as well as professional. And don’t forget to include people you work with in your celebrations. This is where social networks like Facebook can help you out. When we look at Maslow’s hierarchy of needs, you could say this sort of celebration builds up your self-esteem and gives you a feeling of belonging that helps you handle your work. 4. Get out of the house as much as possible. The convenience and privacy that come with working from home might seem great, but be aware of becoming a hermit by getting too used to staying in all day. 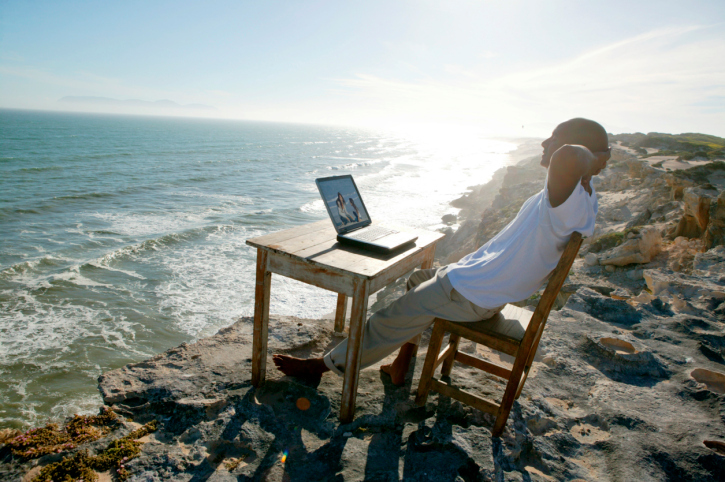 The Next Web has also explained that working remotely doesn’t necessarily have to mean working from home. So, try working from a coffee shop, a co-working space or any other place with other people around you every now and then. If you prefer to be alone and concentrated, at least take a break during a day and go for a walk in the park or meet up with a friend for lunch. Human contact is important for clearing your mind and getting away from your own thoughts for a bit. Real face time increases trust and helps team members really bond with each other. If your team is spread around the world, getting together in the same physical space can be difficult, especially if there are a lot of people involved. Even if you’ve managed to make work run smoothly over online tools, nothing beats an actual, face-to-face conversation and spending time in the same room for a change. Next time you’re planning a get-together, skip having to open 30 tabs in your browser to research the most optimal place to meet and check out Teleport Flock, a tool built specifically to make planning remote team get-togethers as painless as possible. Working remotely is a global trend that is and should be encouraged, if not for no other reason than having a strong positive effect on productivity and employee engagement. But make sure you don’t end up feeling like a freelancer. Feel free to share your tips for working remotely.